What if you erased from your mind the memory of a person you once loved? If this is possible, could you live a normal life as if you never knew him or her from the beginning? 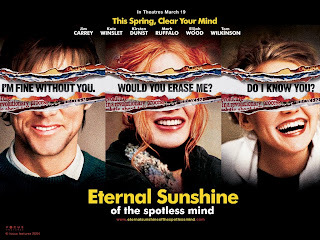 A reflection of a brokenhearted person’s desire to erase lost love, “Eternal Sunshine of the Spotless Mind” starts from the assumption that you can erase memories from your brain. This movie starts with a scene in which Joel (Jim Carrey) wakes up from a deep sleep. He leaves home to take a train to work. Instead, he impulsively takes a train to Montauk. In Montauk, he meets a woman named Clementine (Kate Winslet), who is a unique, unusual person. They are driven by their opposite personalities without knowing that they were once very much in love. The scene switches, and Joel is sobbing. When Joel talks to Clementine, she seems not to have any memory of him. Joel heard from friends that Clementine erased her memories of him. Joel is so sad and pained that he decides to erase his memories about Clementine and goes to the company that helps people to erase their memories. To depict erasing Joel’s memory, this movie crosses between reality and the realm of unconsciousness. As confusing as a surrealistic painting, this movie depicts the convoluted mentality of humans. As Joel erases his memories of Clementine, he finds he had happy memories about her, and he realizes that he doesn’t want to erase his memories anymore. He lets out a painful cry inside of his memory to stop erasing. Despite his desperate cry, his memory of her is totally erased from his brain. However, this movie shows us that even though Joel and Clementine erased their memories from their brains, they couldn’t erase each other from their hearts. This movie is not easy to understand at first, but as you see this movie over and over again, it will linger in your mind. This movie is remarkable in expressing and visualizing the subtle mentalities of humans that you can’t verbally explain but can only represent in surreal ways. Whether sweet or bitter, memories from the past make us who we are today. This movie makes us realize that love cannot be controlled, and it transcends everything. “Eternal sunshine of the Spotless Mind” may be telling us that love is like an eternal sunshine that illuminates our hearts.